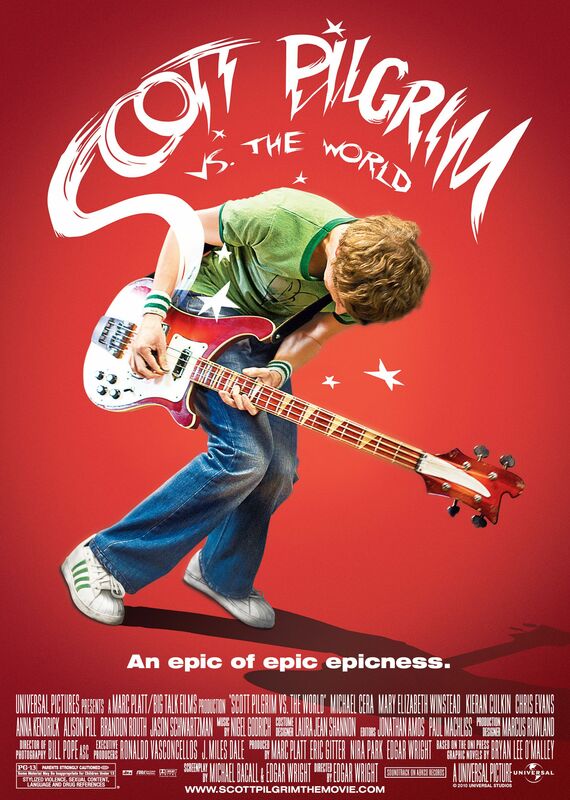 Synopsis: Scott Pilgrim is a 22 year old who is on a road to nowhere until he meets a girl he rather likes. Only problem is that in order to win his affection he has to battle all of her exes. Review: Movies based off video games do not have a good record of being any good, and for the most part, they do struggle to achieve greatness. and some are just flat out terrible. However every so often, one movie comes along that uses elements from video games in order to tell the story. 2014’s Edge of Tomorrow for instance, with the constant re-spawning. Edgar Wright’s 2010 offering, with the screenplay penned by Wright and Michael Bacall, adapting from the series of graphic novels by Bryan Lee O’Malley, also uses video game elements. It does this whilst also telling a love story, and uses them to brilliant, if slightly bonkers results, and one that will make anyone watching, their inner nerd extremely happy. The focus of the story is Scott (Cera), a guy who no doubt many men who watch this movie will relate to. He looks for the direction in life, whilst striving to achieve greatness for his band, whilst also trying to win the affections of that special girl. Lo and behold he stumbles across the the girl of his dreams, in this instance it’s Ramona Flowers (Winstead.) Yet unbeknown to Scott, this lady has seven evil exes that Scott must do battle with, Tekken and Soul Calibur style, in order to win over her affection. Wright manages to fuse video game like tropes and live action very well, and the battles with the exes are somewhat ridiculous, but they are extremely entertaining to watch. There are some quirky and unique methods that Wright inserts throughout the film in order to tell the story, and sometimes to convey the awkwardness in some situations. The whole fight scenes are just like if video games, anime and movies all merged into one glorious package. Romance in movies like these can sometimes feel forced and shoehorned into the story, but in this instance, not so. There is strong chemistry between Scott and Ramona, and you want to see them make it work, there is just the small matter of those crazy exes that Scott has to deal with, including battles with a former Superman in Brandon Routh and a pre-Captain America Chris Evans! No one ever said the hero had it easy! Michael Cera gives a great performance as Scott, he’s dorky, and a bit useless, but you just can’t help wanting to root for him. As Ramona, Mary Elizabeth Winstead, also brings her A game as Ramona, she’s not that weirdo ex, but a friend and someone Scott can turn to as he battles through the crazy exes. The rest of the cast including the likes of Anna Kendrick and Jason Schwartzman all play their roles brilliantly. If you were to try and compare this film to another movie, you’d be hard pressed to find one similar. It’s a very unique film in this regard, and one that if it had been placed in the wrong hands, could have failed badly. Fortunately as it was in Wright’s very capable hands, it passed with flying colours. The quirky humour that Wright is brilliant, is packed throughout the film and it works perfectly. The opening of the movie is a little sluggish and slow to get going, but once the console of the film is fired up, the entertainment and the laughs will carry on all the way to the credits. This is a perfect example of a video game movie done right, even though it is not based on a video game. Nevertheless, for video game lovers out there, this is your movie. Original, unique and very entertaining, with some top performances and some ridiculously funny fight scenes and video game references aplenty, to make the nerd in all of us extremely happy!